If you’re a Verizon Wireless customer, this year’s Mobile World Congress was a bit of a disappointment as information about the carrier’s future handset plans was pretty scarce. We know that AT&T is getting the gigantic HTC One X, while T-Mobile is looking at the slightly lower-end HTC One S. So what about Verizon? According to DroidLife, the carrier will be the proud recipient of two new devices in the next six weeks. 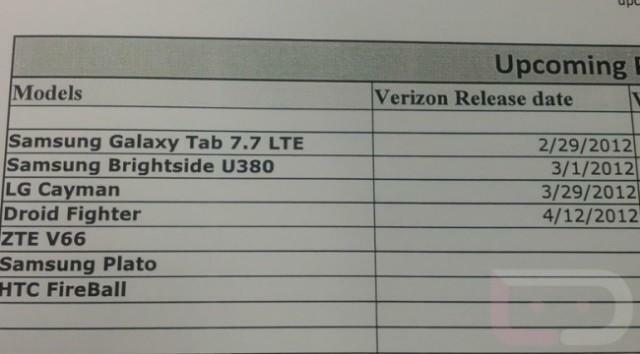 Per a leaked document, the LG Cayman and Droid Fighter both look to be headed to Verizon, with launch dates of March 29th and April 12th, respectively. The devices have apparently been fresh in the minds of Android fans for a few weeks now, as an earlier leak hinted at their impending arrivals. DroidLife says the LG Cayman is likely known as the Lucid 4G, while the Droid Fighter’s alias is still unknown. And that dateless HTC FireBall listed in the document? DroidLife sources are referring to it as the Incredible 4G, corroborating a report from PocketNow on monday. No word on the Samsung Plato, although it could possibly be a reference to a Galaxy-type device. Maybe it will be the Galaxy S III? We certainly hope so, but it’s far too early to know. More information is sure to pop up in the coming weeks as the dates draw near, so hopefully we’ll know more soon.